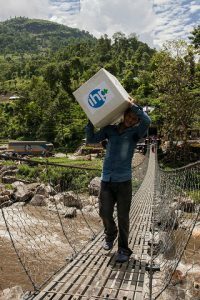 International Health Partners (IHP) is Europe’s largest coordinator of donated medical products, providing tens of thousands of people globally with access to medicines and healthcare who would otherwise find it near impossible to receive. The organisation was founded 12 years ago and was integral in responding to the huge need for medicines as a result of the Asian Tsunami in December 2004 – bridging the gap between pharmaceutical companies who wanted to donate medicines to the emergency, and agencies on the ground who were responding. IHP has a strong reputation among its network of healthcare industry donors, who include some of the world’s largest and most well-known companies as well as with organisations working to provide much needed relief, development and healthcare to people living in some of the most remote and poorest areas of the world. “We respond quickly to humanitarian d isasters, support long-term healthcare development projects and equip medics with supplies for short-term missions through our Doctors’ Travel Packs,” explains Patrick Keys, Health Programme Manager at IHP. Patrick also manages IHP’s Doctors’ Travel Packs (DTP) programme. A DTP is a mixture of over- the-counter and prescription medicines packed in two boxes and serves as a mobile primary care pharmacy. Once an individual has applied for a DTP and IHP has confirmed they are who they say they are, that they are going where they say they are going and that they will use and store the medicines properly, the DTP is shipped directly to a hospital, clinic, surgery or pharmacy in Europe. The pack is then carried by the applicant direct to their final destination. IHP have sent packs to 75 countries across the globe and have good working knowledge of the requirements for customs clearance in many countries. By providing medics and humanitarian workers with the medicines they need to provide quality care, a DTP equips health workers with the resource they need to grow the reach and effectiveness of their work in resource poor environments.